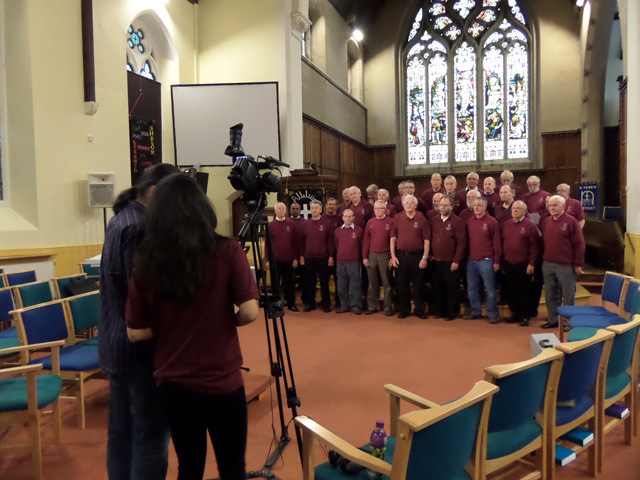 The versatile Gledholt Male Voice Choir can here be seen rehearsing for a film shoot of the old favourite “On Ilkley Moor Baht ‘At.” The piece is to be used by Nalika de Silva in a one woman show to be performed by her at the Edinburgh & Camden Festivals in August 2014. Gledholt Male Voice Choir has been making music for over 65 years and the singing membership is currently 45. Anyone who wants to join the choir or to pop in to a rehearsal to see if this kind of choral singing is for them would be made most welcome. Rehearsals are held on Tuesday nights (7-30 pm). If interested please contact the secretary on 01484 523711 (T), 0793 9003798 (M), or email emmett-robert @sky.com.